What can I say, we love pork. Not going to get into a bunch of food wisdom or any other great write-up today, enjoy a just a recipe. We had this dish a few days ago as lettuce wraps and they were amazing! You could cook your own pork and pull it, but if you want to save time then buy yours from a local farmer, who feeds his piggies properly, smokes it just perfectly and pulls it for you. We buy ours locally from Pork on a Fork. Absolutely fantastic quality pork. My mouth is watering just thinking of how yummy this dish was 🙂 Takes less than 30 minutes to prepare and cook. Best if prepared in a wok. Combine, ghee, shallots, garlic, and serano chiles, saute for 3 minutes then add tomatoes, bell peppers (best you use 2 green, 1 red bell pepper). 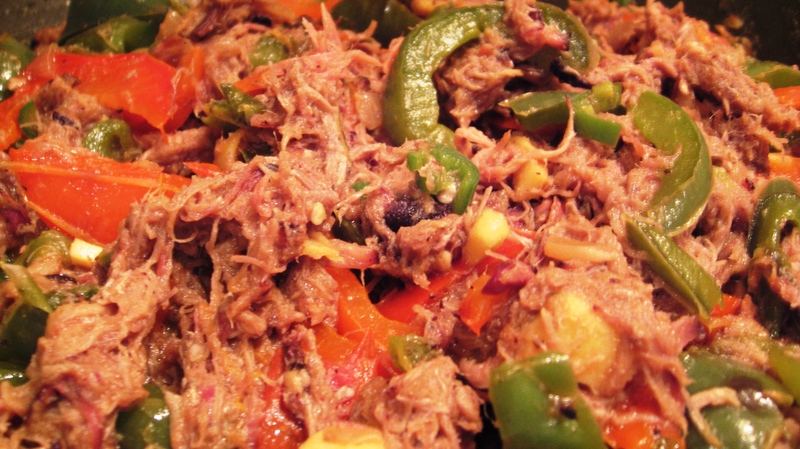 Cook until all veggies are tender but not too soft, add in the smoked pulled pork and stir together. Sea salt to taste and add minced ginger and coconut milk, reduce heat to low and simmer for 15 minutes. Serve with salad, or sweet potatoes or on a shallow bed of quinoa. We also like it as lettuce wraps.